A cabinet advisor unveiled recently that Japanese prime minister Yukio Hatoyama would start using Twitter in the beginning of next year to let the people know how the government is working on political issues. On the Christmas day in prior to his first “REAL” tweet, someone (an ex-theater writer a.k.a. a blogosphere fussbudget) has pretended him to twitter, which gave rise to confusion among the leading party and Japanese politicians using the service. 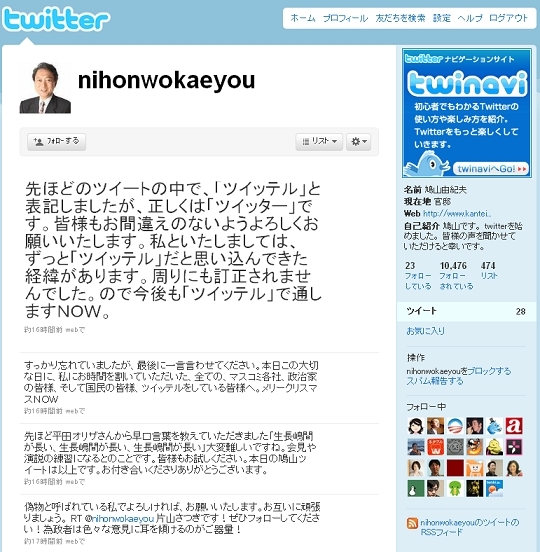 On 25th at 1pm, someone set up a Twitter account named “nihonwokaeyou” (meaning let’s change Japan), which was not confirmed as an official, put the prime minister’s portrait on the Twitter account profile and twittered, “Very nice to see you, this is Hatoyama. I’m very pleased to hear your opinion via Twitter.” He has posted more than ten messages and been followed by more than 10,000 Twitter users. Many people have asked the cabinet press office if he’s real or not throughout the day, and they were busy dealing with those inquiries. The press office and Twitter Japan jointly confirmed it as a fake account and prime minister Hatoyama had not yet begun using Twitter. Twitter suspended this spoofing account since it was considered as having been used for “strange activity”.